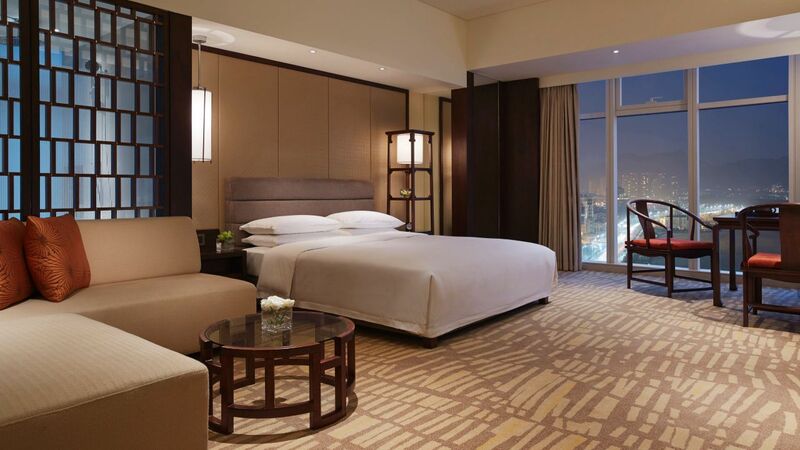 84 sqm suite features one king-size bed, a self-contained workstation and wireless high-speed Internet access. A glass-encased marble bathroom features a rain shower and separate bath tub. Separate living room with Dining and study area. 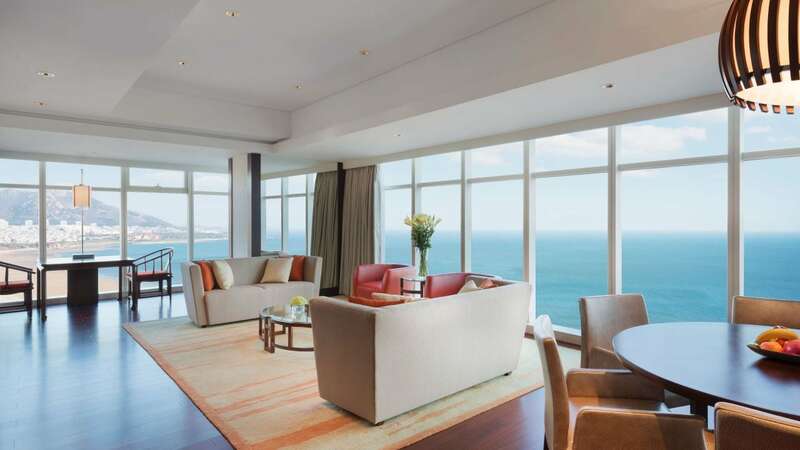 Floor-to-ceiling windows frame city and partial sea view. Lavish Regency Club facilities include daily complimentary continental breakfast, all-day tea/coffee, and evening canapés and cocktails. Boardroom access is subject to availability. This is a standard suite. Please see World of Hyatt program terms for upgrade eligibility. 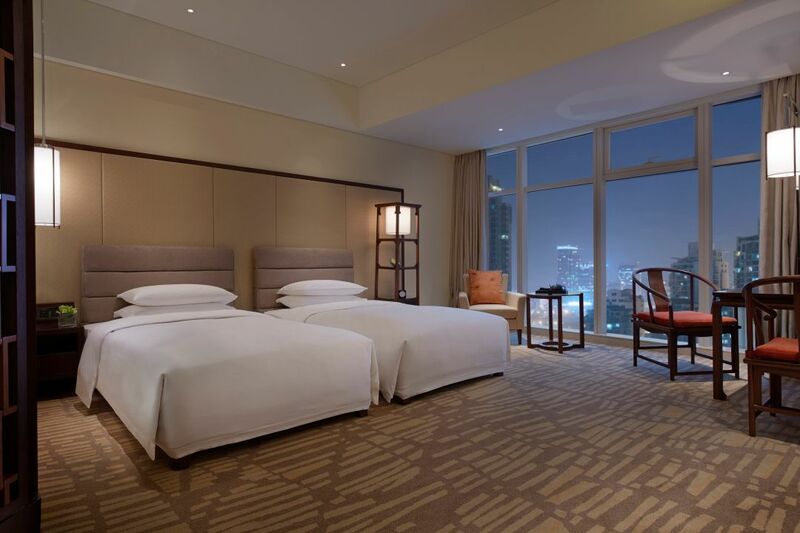 84 sqm suite features two twin beds, a self-contained workstation and wireless high-speed Internet access. A glass-encased marble bathroom features a rain shower and separate bath tub. Separate living room with Dining and study area. Floor-to-ceiling windows frame city and partial sea view. Lavish Regency Club facilities include daily complimentary continental breakfast, all-day tea/coffee, and evening canapés and cocktails. Boardroom access is subject to availability. This is a standard suite. Please see World of Hyatt program terms for upgrade eligibility. 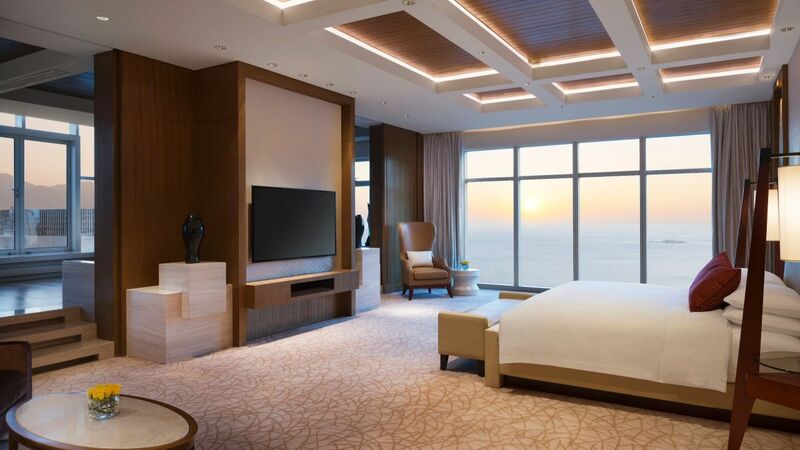 84 sqm suite features one king-size bed, a self-contained workstation and wireless high-speed Internet access. 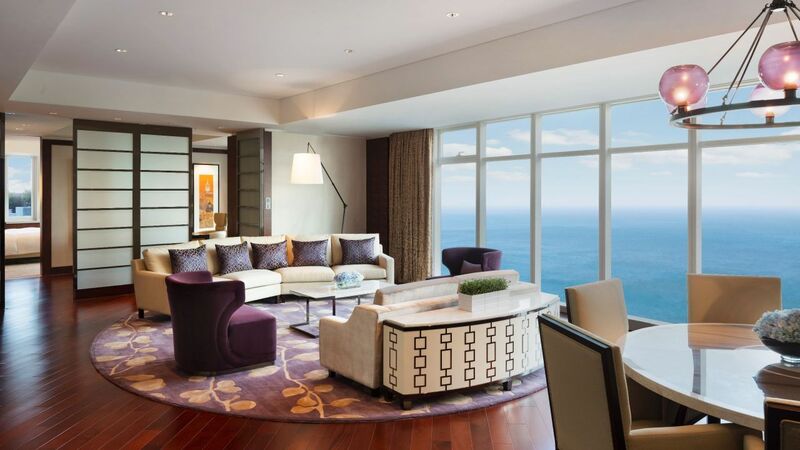 Floor-to-ceiling windows frame 270 degrees full ocean view. A glass-encased marble bathroom featuers a rain shower and separate bath tub. Separate living room with study and dining area, as well as a large walk-in closet and a double wash basin vanity. Lavish Regency Club facilities include daily complimentary continental breakfast, all-day tea/coffee, and evening canapés and cocktails. Boardroom access is subject to availability. 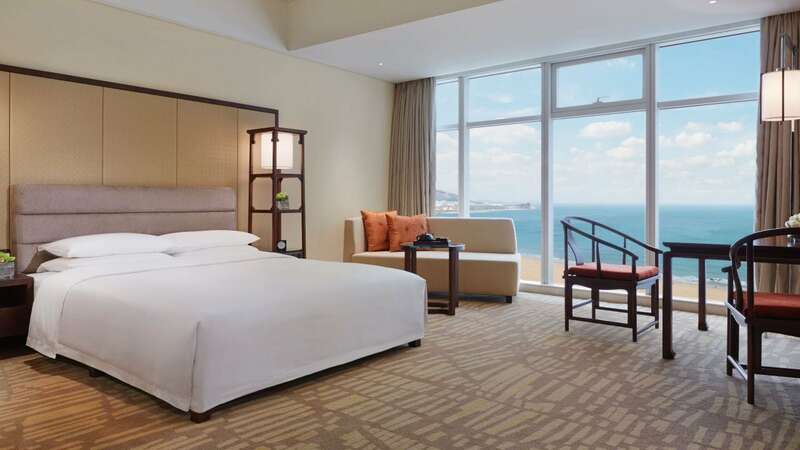 One king bed 168 square meters of space Modern and traditional Chinese decor 270 degrees of Shilaoren beach view Regency Club access An outdoor terrace overlooking the ocean Branded bath amenities This is a premium suite. See World of Hyatt program terms for upgrade eligibility. 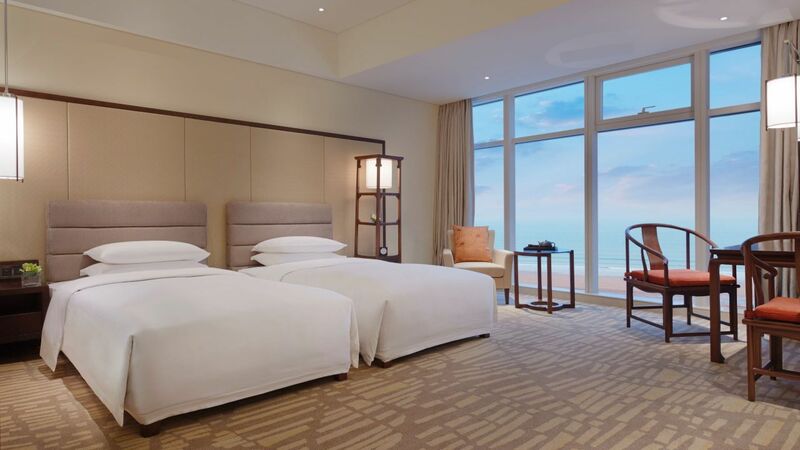 Two bedrooms 505 square meters of space Modern and traditional Chinese decor Shilaoren beach view and city view Regency Club access A spacious outdoor terrace overlooking the ocean Branded bath amenities Butler service avaliable This is a premium suite. See World of Hyatt program terms for upgrade eligibility.